Conventional concrete is highly vulnerable to constant attack from chemical, mold spore, and moisture ingress that can severely damage its surface and interior. However, concrete containing EdenCrete® is fortified with revolutionary carbon nanotubes that help protect beams, bridges, barriers and other types of concrete structures from assault by these threats. On many roadways, it is common to see concrete barriers that are stained and/or discolored, often caused by mold. In these cases, fungi spores have infiltrated the porous surface and multiplied into a growing mold. Cleaning mold from concrete can be costly and challenging. EdenCrete® reduces the permeability of concrete, making it more difficult for spores to penetrate and thrive. Reduced permeability can also make it easier to clean up spills which occur on a concrete surface, before the stain can set. Water ingress is no friend to concrete. In fact, it is one of concrete’s biggest enemies. Moisture can seep into concrete and degrade it from the inside out, causing deleterious effects such as alkali silica reaction, aka “concrete cancer.” (Learn more about how EdenCrete is curing concrete cancer here.) When alkaline cement paste and non-crystalline silica found in many regional aggregates react, they cause internal swelling. 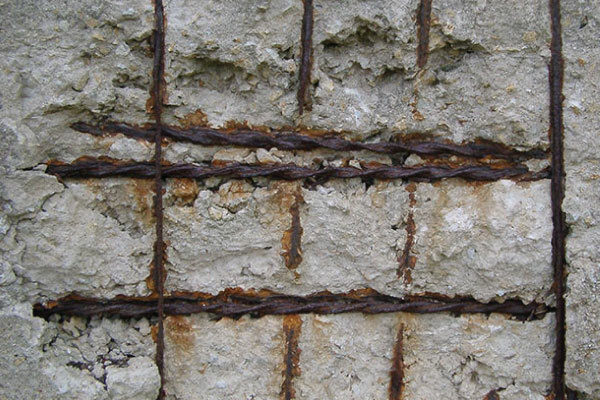 In some cases, water ingress may penetrate deeply enough to reach and corrode steel reinforcement. By making concrete less permeable, EdenCrete helps keep concrete “out of deep water” when it comes to moisture damage. When winter storms hit many areas of the country, de-icing salts are scattered generously on roadways, bridges, and residential concrete to impede water from freezing. This is good news for drivers, but not such good news for concrete. The ingress of moisture containing chlorides from the de-icing salt is highly corrosive. After repeated freeze/thaw cycles occur, the concrete surface will begin to “scale off”, or detach. Water that does seep into concrete and freezes expands 7 to 9% by volume, degrading concrete from the inside out. EdenCrete® helps concrete survive winter by significantly reducing the permeability of the concrete, protecting against the damage of de-icing salts and freezing water. See how EdenCrete has proven its strength. Click Below to view our case studies and see how EdenCrete® showed significant increase in key concrete attributes such as Permeability, Flexural, and Abrasion.